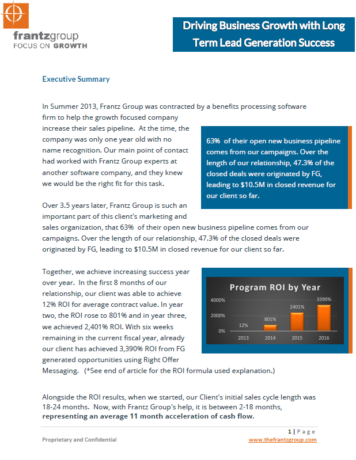 In the Summer of 2013, Frantz Group was contracted by a benefits processing software firm to help the growth focused company increase their sales pipeline. At the time, the company was only one year old with no name recognition. Our main point of contact had worked with Frantz Group experts at another software company, and they knew we would be the right fit for this task. Over 3.5 years later, Frantz Group is such an important part of this client’s marketing and sales organization, that 63% of their open new business pipeline comes from our campaigns. Over the length of our relationship, 47.3% of the closed deals were originated by FG, leading to $10.5M in closed revenue for our client so far. Put another way, the ratio of dollars spent on outbound lead generation to dollars closed from the resulting leads currently stands at 5.12%. It doesn’t end there, there are still more active leads in the pipeline that haven’t closed yet. Alongside the ROI results, when we started, our Client’s initial sales cycle length was 18-24 months. Now, with Frantz Group’s help, it is between 2-18 months, representing an average 11 month acceleration of cash flow. Our unique approach to Technology Lead Generation, including regular messaging and audience iteration and evolution, and tremendous persistence has lead to an ongoing flow of opportunities. In addition, these opportunities are closing at a strong rate and at an earlier point in time than originally expected, driving great benefit to our client. The length of the program has helped keep our nurture pool full, enabling Frantz Group resources to handle the majority of the lead nurture duties until the opportunity is ready to be worked by our client’s sales team. In addition to boosting business growth and accelerating revenue, this is a strong boost in productivity for our client. Download the case study to learn more about our approach to these challenges and how growth and success were achieved, or contact us at 800-707-0064.